Construction – This is not too surprising. Any mower in this sort of price range is not going to be the most solid thing in the world. It’s not going to get you reliving those memories of the Flymo you had twenty years ago which gave you a good ten seasons of service.No, it’ll probably last you two or 3 seasons. But at this price it is the closest you can probably come to a disposable mower and even if it lasted you 2 seasons it’s still a pretty cheap way to maintain your lawn. Plastic blades – This is a bit of a pain to be truthful. There a handful of the Flymo hover models that do use plastic blades. I guess that is to keep costs down as these are the cheapest models too. The problem with these blades is that they don’t last long at all.They break easily if you do come across that rogue stone which is hidden in your grass and they don’t deal well with longer grass either. On the up side, the blades are easy to change and you can buy them for really cheap.This is definitely a necessary evil with this mower in particular. You sacrifice a bit of quality in the blade department to bring the overall price of the mower down. Real easy to use – This is probably the simplest mower you could ever have the pleasure of operating. There’s really nothing to it. No grass box to worry about. Just plug it in, start it up and push it where you want to go. When you’ve done just release the trigger to shut it off, wind the cable in and pack it away. Jobs a good ‘un. 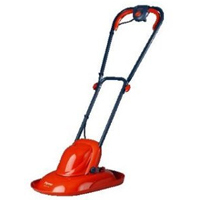 Really lightweight – This has got to be one of the lightest lawn mowers out there at 4.5kgs. When I say it’s usable for anyone I really do mean that. Whether you are young, old, male, female or have a disability this mower will be suitable for you. Easy to store – The mowers design is really compact and as a result when you come to putting it in the shed after mowing, it really doesn’t take up much space at all. Easy to clean – The simplistic “shell” of this mower is really easy to clean out. There are not really many places for the grass to get stuck. A quick wipe out post-mow will keep the Micro Lite performing at it’s best. Quiet – The Flymo Micro Lite really is a true gent – he doesn’t want to wake up your dog or annoy the neighbours. No, he just goes about his business nice and quietly allowing you to enjoy the sound of the birds and the fresh air whilst you’re getting the job done. Great Value for money – This is an ideal first mower if you’ve just set up home and you’re looking for something cheap to just keep the lawn looking half decent. In fact it’s one of the cheapest options you will have. For the job it does it’s reasonably priced. Not easy to assemble because the instruction manual is absolutely awful. It is probably about as vague as they come and the handle (which is pretty much the only thing which needs assembling) is not particularly easy to assemble and is further complicated by the misleading instructions. Get two of you on the job and it’ll be a lot easier. Cutting Ability – So with this mower you’re not exactly buying the “Rolls Royce” of lawn mowers. No you are just getting a cheap little run around which will get the job done. It cuts the grass fairly well. It doesn’t cut overly short, so if that’s what you’re looking for then this won’t do the job, but it does tidy the lawn up.If you buy this with these expectations then you won’t be disappointed in the slightest. This mower was designed to be used with the “little and often” saying in mind. Anyone thinking they are going to let their grass grow into some kind of forest and then tackle it with a Flymo Micro Lite is in for a rude awakening.You should be mowing your lawn once a week with this mower and then twice a week in summer as it just isn’t meant for use on longer grass. Besides, a small lawn only takes a few minutes to get done anyway so mowing regularly shouldn’t be too much of a problem for users of this mower. Manoeuvrability – This is so unbelievably light and easy to push. You could almost blow on it and it’d move. Ok, so we are not going to pull any punches here. This mower certainly isn’t designed with every garden owner in mind. In fact I would say that if you’ve got anything bigger than a “small” lawn, then just forget this mower all together.Also, it’s not the best made mower in the world. But at the same time, it is one of the cheapest. In terms of construction and longevity it does have weaknesses. But it is also easy to use, very light, easy to transport, keeps the grass looking tidy, easy to store and most importantly very cheap.If you’ve got a small lawn and this mower lasts you 2 or 3 seasons then that is extremely cheap mowing.